When it comes to people and companies offering debt help services in Canada, everyone claims they want to help you, but not everyone has your best interests at heart. For some dedicated professionals, providing quality debt help services is something they really care about, but for others, it’s just a business – and they want to make as much money from it as they can. So how can you figure out who to trust and who wants to use you to make their sales targets? Below are 6 key ways to take a peak in the back door and see what’s really going on. None of the best debt help or consumer credit counselling services in Canada ever have more than one or two complaints filed against them with the Better Business Bureau within a 3 year period. You can use this measure with all debt relief service providers from the smallest ones right through to the very largest. The reason why this measurement of quality works is simple: if you do good work, people don’t complain. You can search the Better Business Bureau for any for-profit or non-profit service, or you can do a Google search with the letters "bbb" after the name of the company you are looking for. 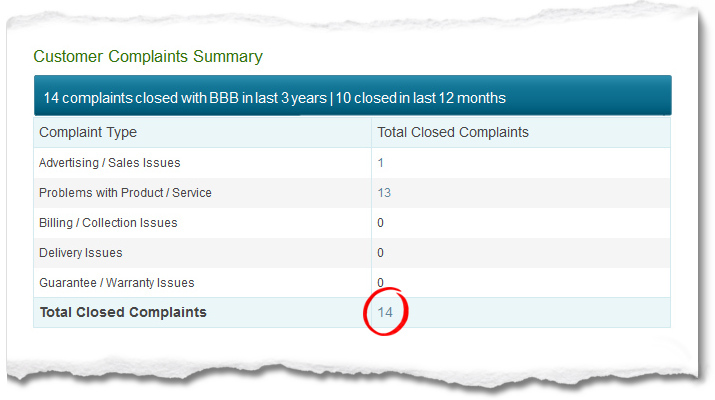 In this excerpt from the Better Business Bureau's website you can see that the company reviewed here has 14 complaints filed against them over the past 3 years. The best debt help services organizations usually have 1 or 2 complaints at the very most. Have a look and see what a company or agency’s customer reviews look like. You can simply Google a company’s name plus the word “reviews” to find them. Be sure to look for reviews in more than just one place. What do their reviews look like on Google (Google Maps), Yelp, or Facebook? Is there consistency with the average rating on all these sites or is there just a company sponsored love-in taking place on one of the site? Also be careful of reviews found on websites you are not familiar with. Some review sites accept money to promote the companies they claim to be offering unbiased reviews on. What do a company’s former employees think of the organization? Were they proud of the help they provided when they worked there, or did they see their role more as a sales person striving to meet sales targets and earn their commission off of unsuspecting consumers? It might surprise you to learn that a very large number of people holding themselves out as Credit Counsellors, Debt Consultants, Restructuring Specialists, Debt Advisors, or any other similar sounding title, have no formal financial education and many of them had little to no experience in personal finance before starting their current jobs. While this fact is less than confidence inspiring. It's not illegal. In Canada anyone can offer debt advice. What is even more concerning, though, is that most debt counselling companies also provide very little financial training to their employees, and the training they do provide usually focuses on the one or two products that are the most profitable to the company. One of the products that is now promoted by a lot of Debt Consultants is a consumer proposal. However, it is actually against the law for anyone to offer a consumer proposal other than a licensed Bankruptcy Trustee. So many companies who claim to be able to help consumers consolidate and eliminate debt by offering them a consumer proposal are actually just funneling business to Bankruptcy Trustees for a fee. People can actually save money by finding a reputable Bankruptcy Trustee themselves, or they can get objective advice and look at all available options by finding a Credit Counsellor who doesn’t work on commission. This point may seem funny, but it can actually reveal what a debt help service is all about. If an agency exists to make as much money as possible, they will have as few locations as possible. Renting offices and paying people to staff them cost money. It’s way cheaper to “serve” the entire country with a call centre in one location. Agencies that really want to help people usually demonstrate this by opening up real offices staffed by real people so they can be there to actually help people one-on-one. Some companies pretend to do this by claiming to have offices, but when you Google the office addresses you find most of them are only virtual offices with mail boxes, meeting rooms, and a receptionist employed by the virtual office company. So the bottom line here is simple, the agencies that care about you the most will have a real office located near you. Those who are working the hardest to turn a profit won’t. When it comes to trusting someone with your finances, it is important that they be regulated and accountable. In Canada, debt help services aren’t as regulated as many people would think, and where they are regulated, rules meant to protect consumers aren’t always enforced. So it’s important that any organization you deal with be accountable to a national association of their peers who can revoke a member’s accreditation or membership if they don’t provide quality services. To get the most objective help and guidance, look for an agency that is accredited by Credit Counselling Canada. These standards help ensure that consumers receive quality help and guidance and that this advice is as objective as possible and not slanted by motivations of personal gain. 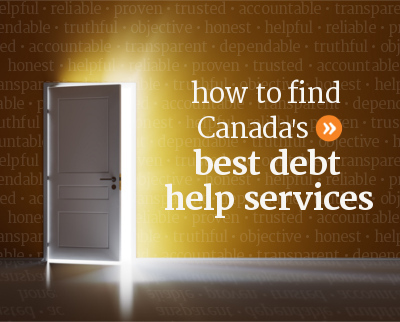 To find the best debt help services, check out our list of local non-profit organizations who are accredited by Credit Counselling Canada, or visit Credit Counselling Canada's website and find a local accredited agency near you.